never was i ever a runner. you can ask anyone that knows me & they'll tell you i always hated it. i used to walk the mile in high school for my p.e. class & tennis team. i refused to run. sometimes i would go on runs with my friends around town or on the trails behind my house. they would push me & i kind of liked it. but i never liked running on my own. last summer my sister convinced me to sign up for disney's tinker bell 1/2 marathon. i had every intention of training, but couldn't bring myself to run that far or often. the day of the race came & needless to say, it was extremely difficult. but...i kind of loved it. there was such a hype! everyone was so excited, i definitely felt a rush. 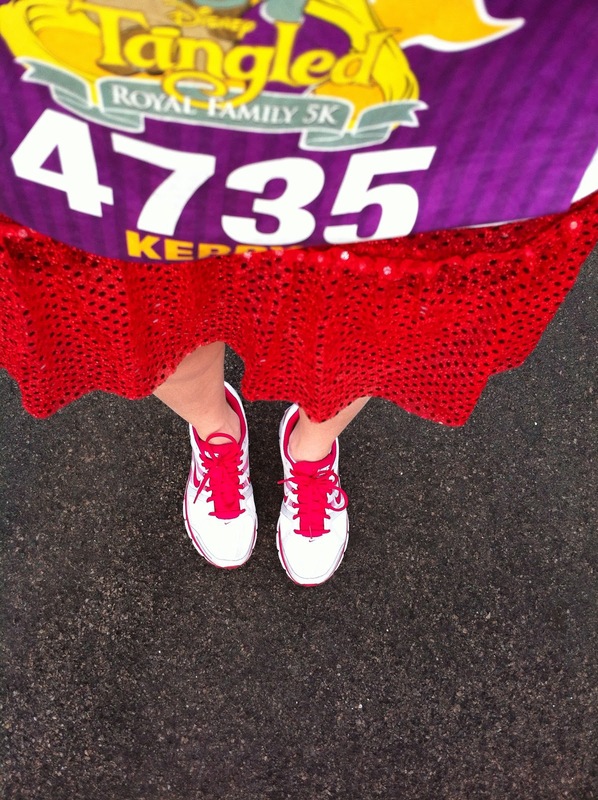 plus, there were a million other runners with me & i liked that. after that race i decided to sign up for disney's princess 1/2 marathon, which was a month later. once again, i didn't really train. but it was easier! my body knew what was going to come, & i still loved it! i've now signed up for two more races in september & i'm actually training for these two. after racing & trying to train, i've realized it's not running i love. it's the race itself & how i feel afterwards. the vibe, the hype, the rush of the race. i love it. & i love pushing myself to do better every time. every time i run now, i feel better & kind of stronger. running has taught me a lot about myself. if you asked me a year ago if i would ever run any sort of marathon, i would have laughed & said no; but in this year alone i've already ran two! two more than i ever thought i would. so, i learned i can accomplish a lot. i just need to keep pushing myself. i have also learned that i need to allow myself time. i'm the kind of girl who thinks i don't need to practice, prep, train, or whatever & that i can go out & do anything without any side affects. i learned that i was very, very wrong. yes, i can push through something & complete it, but it's not going to be easy. there aren't a lot of short cuts you can actually take; especially when it comes to running. i need to stop expecting to do a great job when i didn't put the work & effort into training. one of the best things i've learned though, is that running can completely clears my mind of whatever has been bothering me. it's one of the best stress releases, which is funny since running isn't necessarily my favorite. but every time i run, not only do i feel better about myself, but i feel clear headed & like i have everything figured out. & who doesn't like that feeling? O, MY GOSH! Me and my friend are talking about doing this next year! so awesome that you did it!